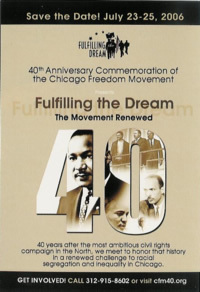 In 1966 the Chicago Freedom Movement (CFM), led by Martin Luther King and Al Raby, pioneered the nation’s first large-scale movement to end racial segregation in a sprawling metropolis. Now, nearly 40 years later, veterans of the CFM, current civil rights activists, young people, clergy, community members, and historians held the Fulfilling the Dream Fortieth Commemoration Conference on July 23-25, 2006 to challenge continued discrimination in housing, education, and jobs; leverage the CFM experience to support and strengthen a new generation of activists, and develop a revitalized economic and social justice agenda for greater Chicago. The CFM Archive site chronicles the people, organizations, and events that formed the movement, and brings together a vast collection of movement material. More than 20 additional planning committee members from around the U.S. have been actively involved on this project.